In term of primary share business in Bangladesh, the primary share market is where securities or shares are created. In this market, Company or firms sell new stocks or share and bonds to the public for the first time. Just think, the primary share market as the market where an initial public offering (IPO) takes place. If you do not like to take risk, you must start with primary share business in Bangladesh. The secondary share market is where investors buy and sell securities or share they already own. This kind of share market, most people typically think of as the “stock market,” though shares are also sold on the primary share market when they are first issued by the company or firm. Secondary Stock business in Bangladesh is more risky than Primary Share Business in Bangladesh. Learning share business is very important for secondary stock market. An initial public offering (IPO) is the first time that the share of a private company or firm is offered to the public. IPOs are often issued by smaller company, seeking capital to expand. In this process, most of the times, winner of the shares are selected by computerized random system if investors rate is higher than total shares. You must be a member of any Stock broker house listed in Dhaka Stock Market or Chittagong Stock Market to start share business. In share market many people are investing their money for profit. But profit is very sensitive word in our share market. If you want to be a profitable investor in share market, you should careful and very much aware about the following facts. How to start profitable share business in Bangladesh? You must be proper educated about different terms and conditions of our share market. In share market there are lots of instruction to learn about share market. Before entering in the market we must learn those knowledge which are located Dhaka Stock Exchange website at dse.bd.org or dsebd.org These kind of information will help us for invest our money and gain profit. You can also attend in different seminar which are arranged by SEC and DSE and CSE for searching more information and knowledge related to share market. Careful about decision and time in share market when anyone enter into share market. Time and decision are very important in share market. If you take the right decision in right time, you will be a gainer. But if you miss it, you will miss the profit. So, if you want to be a profitable investor you should take right decision in right time. 1. which company gives regular dividend. 2. which company have low PE ratio. 3. which’s EPS is high and good. 4. which’s paid up capital is good. 5. which company is developed and developing. 6. Company’s per year profit and increasing rate of profit. 8. Top management person’s skill. 9. Different project of this company. 1. Government thinking about market. 2. Government decision on the market. 3. Respective authority’s decision and thinking. 4. Different index of share market. 5. Different terms and conditions of share market. You must have practical knowledge about the stock business in Bangladesh. You, must know about turnover of share market. For example, if you have experience to do share market, you can run your share business very well. The business is well, if you experienced. Wrong Information! How to buy share in Bangladesh stock markets. Wrong information is a very bad thing in share market. Many investors who are our family member and friends, sometimes gives us wrong information, which can misguide us from our plan. In this situation, you should know how to buy share in Bangladesh share market. How to control yourself? If you want to be a profitable investor in share market, you should avoid wrong information and people’s talk. You should heard the information which written and have legal evidence. If there is any kind of information, at first, you think, observe and then take decision to buy stare. 1. Dividend policy of the company and last few years dividend declaration . 2. Price of last few days. 4. P/E Ratio of this share. It is must that, thinking, research is very much effective for buying shares in the secondary share market in Bangladesh. You do not need to think or observe much if you want to start Primary share business in Bangladesh through IPO. How to sale your share in the market? Selling is the activity for receiving profit. For sell, it is important that thinking of better position is not good in every time. Sometime, it is OK. But in volatile market thinking for more profit is very bad. We can receive profit T+3 days. So, it is right decision to sell the shares. But if the profit cannot gained, it is must that the shares investment shifts into long time share investment. If anyone in profit, it is good that he sell half of the all shares and hold another half for further more profit. 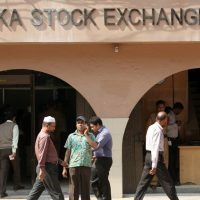 Is Stock business in Bangladesh risky? Risk is very natural time in share market in Bangladesh. In risk awareness and creativity and calculative activity is very much important. If anyone in risk or anyone buys shares in high price, he/she must take the netting facility and must hold shares for profit. Don’t be panicked in the time of bad share market. So, in risk, be calculative, be sincere, be thinking person and be share holder person for longtime. Profit is very hard or easy issue in share market. If we analyze the market, think before buying, you will be the profitable investor in the Share business in Bangladesh. How to start share business in Bangladesh? Contact with a share broker house. Open BO Account with them. If you want to apply for IPO, collect new company IPO form from in-front of share market, Motijheel, Dhaka. Read all instructions on the form, Fill up he form with your information, Like BO Account No, Bank Account, address. Deposit the said amount the selected bank. Wait for the lottery Draw. Check stock winner list. if you win any share wait until the share is mature for secondary market. Then, go to market, in your broker house and sell the share when it profitable for you.